We know that a current carrying conductor creates a magnetic field around it. 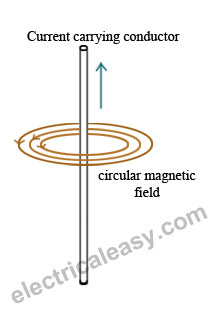 The nature of magnetic field around a straight current carrying conductor is like concentric circles having their center at the axis of the conductor (as shown in the figure at right). The direction of these circular magnetic lines is dependent upon the direction of current. The density of the induced magnetic field is directly proportional to the magnitude of the current. Direction of the circular magnetic field lines can be given by Maxwell's right hand grip rule or Right handed cork screw rule. 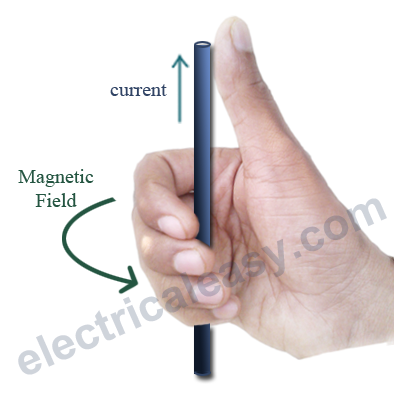 Assume that the current carrying conductor is held in the right hand so that the fingers wrap around the conductor and the thumb is stretched (as shown in the figure at left). If the thumb is along the direction of current, wrapped fingers will show the direction of circular magnetic field lines. 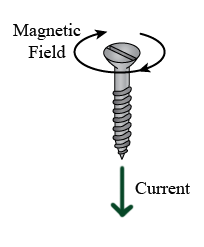 If a right handed cork screw is assumed to be held along the conductor, and the screw is rotated such that it moves in the direction of the current, direction of magnetic field is same as that of the rotation of the screw.